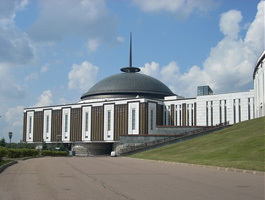 The Central Museum of the Great Patriotic War of 1941-1945 is situated in the center of Victory Park. It was opened on May 9 1995 to celebrate the 50th anniversary of the victory. The Second World War (which is known as the Great Patriotic War in Russia) was the bloodiest war Russia has ever suffered. More than 27 million people perished; there's hardly a family who did not lose a friend or a relative in the War. The Museum contains memory books with the names of all Russians who, with great courage, devoted themselves to defending their motherland. Today a new computer search system helps visitors to find information on the soldiers more easily. The Hall of Glory shows the names of 11,717 participants in the war who were awarded the honorary title of "Hero of the Soviet Union". 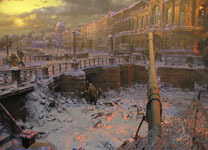 In the Hall of Memory there are six dioramas depicting the biggest battles fought during the war: "The Counteroffensive of the Soviet Troops Near Moscow in December 1941"; "The Joining of Fronts, Stalingrad"; "The Siege of Leningrad"; "The Battle of Kursk Bulge"; "The Crossing of the Dnieper, 1943"; and "The Storming of Berlin". 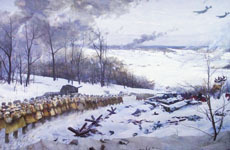 The museum also has a historic and military display named "The Path to Victory". It shows the history of the war from the Nazi invasion of USSR in 1941 to the end of the war, and victory, in 1945. If you're interested in the history of the World War Two in the Eastern Front you should include the Great Patriotic War Museum in your itinerary. You can visit it on your own while walking around Victory Park, or book a tour with a Moscow travel guide.